Si-Tex’s 880CF with Internal Antenna with an 8” color display is a powerful GPS/Sonar combination which is easy to operate and provides top notch performance. Built in 52-Channel GPS Receiver, Dual-Frequency Fishfinder and included Navionics Nav + Mapping. Si-Tex has a powerful big screen combination chartplotter/fishfinder in the SVS-880CF that would fit on almost any size boat and in every budget. The Navionics+ Chart Card that comes with each Sitex SVS provides high detail navigation charting coverage for all of North America including Canada and fresh water lakes. Navionics+ also provides unlimited navigation chart updates with Freshest Data, sonar chart downloads and community edit downloads free for one full year. Not only does the SVS-880CF use Navionics charts but it will also read C-Map Max charts. With the LED backlighting the SVS-880CF has great sunlight view ability and can be seen on even the brightest days. The dual frequency 600 watt sounder of the SVS-880CF can help you find and catch fish even to depths of 1000’ or greater. Installation of the SVS-880CF is easy as well just connect power and transducer and with the internal 52 channel GPS receiver you are almost done. There is of course an optional external antenna in case your spot to mount it does not allow the SVS-880CF to acquire satellite signal. If you want a large screen, durable, solid performing chartplotter/fishfinder and don’t want to spend a lot then you should consider the SVS-880CF from Si-Tex. 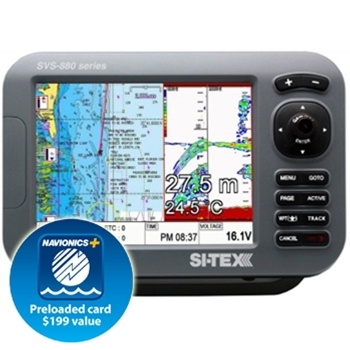 Each Si-Tex SVS-8800CF comes with:Si-Tex SVS-880CF, Navionics Plus Chart Card, Sun Cover, Mounting Bracket, Knobs, Power Cable, Fuse & Bolts, Manual and a Two-Year Warranty. Si-Tex’s 880CF-E with External Antenna with an 8” color display is a powerful GPS/Sonar combination which is easy to operate and provides top notch performance. Dual-Frequency Fishfinder, External GPS Receiver and included Navionics Nav + Mapping.